EXCLUSIVE When his socks are loaded with mugs of beer, his day is sure to be full of good cheer! Our Good Day socks were thoughtfully designed with the uplifting message, “Gonna Be a Good Day™”, on each toe, bringing an extra hint of happiness and positivity every time they put them on. This unique pair features a playful beer motif and comes in a coordinating gift box, making them a truly original gift for birthdays, get well or simply to start someone’s day off on the right foot! When his socks are loaded with mugs of beer, his day is sure to be full of good cheer! 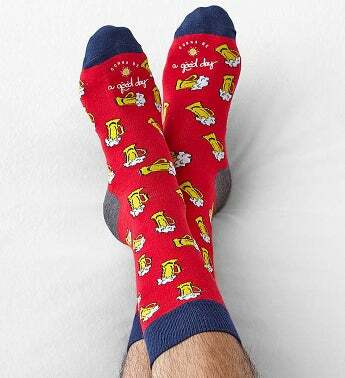 Our Good Day socks were thoughtfully designed with the uplifting message, “Gonna Be a Good Day™”, on each toe, bringing an extra hint of happiness and positivity every time they put them on. This unique pair features a playful beer motif and comes in a coordinating gift box, making them a truly original gift for birthdays, get well or simply to start someone’s day off on the right foot!